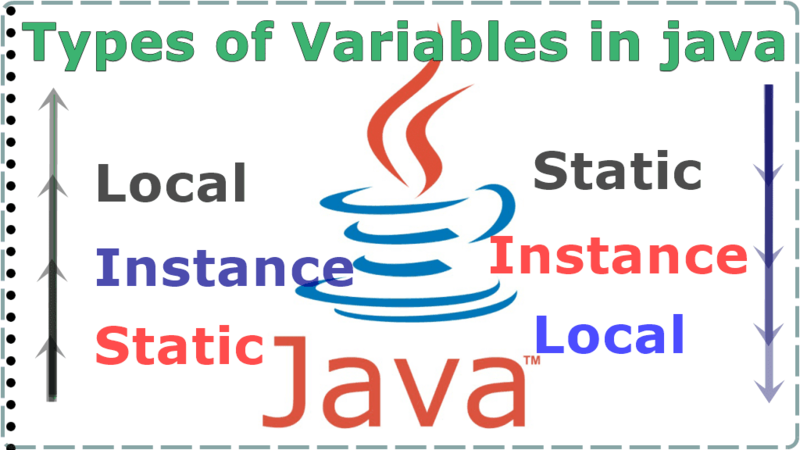 In this post, we will talk about java variables, Types of Variables in java with complete explanation and examples. Like a different type of variable how to use it?. how to access it etc?. So java is the class base language the class contains five elements. So C/C++ language contains variable int a=10 b=20 etc. in the same way java also contains some variable part. so to work with employe project we need employee id, name, salary etc. So every project required variable concepts. So before going to the variable concept. First of all, we must know what is the purpose of the variable in java. So the variable is used to store the values by using these value we achieve the project requirements. For example, an employee project, we need employee salary, name, id etc. So in a single line variable are used to store value and by using these value we achieve the project requirements. generally, variables are 3 types. 2. The scope of the local variables only within the method only or within the constructor or within the blocks only. So simply can say that local variable cannot be accessed outside the method, block, constructors. If we trying to access the local variable outside it generates the error message. 3. local variable Memory Allocated when method start and the whenever the method is completed memory is released. Local variable stored in stack memory. So before the brief of instance variables, we must know areas of java language.java contains 2 types of areas, instance area, and static area.so once we understand these 2 areas then java variables concept is very easy. So the body of instance method called instance area, and the body of the static method called the static method. 1. The variable that is declared inside the class but outside the method, Those variables called instance variables. 2. The scope of the instance variable is inside the class all methods, constructor and blocks are able to access. 3. For the instance variable memory allocated when the object is created and memory is destroyed when the object is destroyed. Note:- When the same area we can access the instance variable directly. But in a different area, first of all, we must allocate memory of instance variable So how memory is allocated, linked with the object, means create an object of that class in a single line, first of all, create an object of that class. And access that class instance variable and method by using that object. 1. The variable that is declared inside the class but outside the method with a static modifier, Those variables called static variables. 2. Static variable memory allocated when the .class file is loading. 4. Static variable stored in non-heap memory. Note:- access the static variable and method by using the class name. Reason static variable memory allocated when the .class file is loading. means before the main method load, static variable memory allocated.